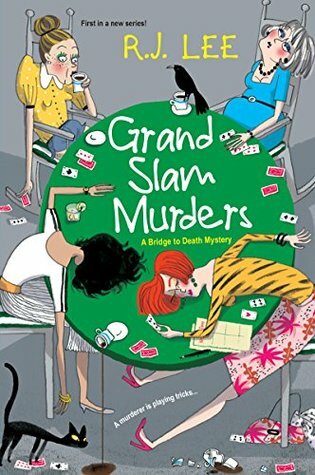 Grand Slam Murders by R.J. Lee is the first book in the new cozy A Bridge to Death Mystery series. As with most cozy mystery series the murder mystery in this first book is solved at the end without any cliffhangers. This story really tosses a reader right into the action with the opening chapter joining the four wealthy ladies that are members of the Rosalie Bridge Club as they are about to play a game. However, instead of some competitive cards we end up with a four way murder when all are poisoned. Wendy Winchester works for the local paper but instead of the hard hitting investigative journalism she wants to do she has been put in the position of writing the fluff pieces. When the four wealthy women are found to be murder victims Wendy is given the opportunity she has been waiting for to jump in and investigate the murder. I have to say Grand Slam Murders seemed to have some good points but it also had some things I wasn’t a huge fan of. One, I didn’t like the way we waited to introduce our sleuth and star of the story until after things got going which made it slower for me to connect o her, I was scratching my head a bit at that. But I do enjoy when a lead has some connection to law enforcement which Wendy did. Now I did think there were some interesting characters in here but I also thought things seemed to get a bit draggy as it went on with the questioning etc. Overall, 3 stars for this opener with the ups and downs for me. Great review, Carrie! I’ve been on the fence about requesting this one. It’s interesting that it’s slow getting to the sleuth. Not opening with the main character can be hit or miss with me. Great review Carrie. I did not request this one because I did not like the cover. I am kind of glad I passed now.